Do you want allow more natural light into your home during the day? Would you love to be able to see the stars twinkling in the Texas sky above your home at night? Adding a skylight to your Houston home will increase natural light intake during the day and give you a beautiful view of the night sky as well. At Live Oak Construction, our expert Houston skylight installers have brought the gift of more natural light to hundreds of homes across the region. 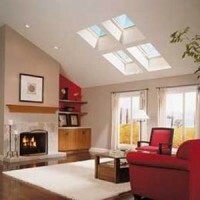 Solar tube skylights are ideal for smaller rooms such as closets, hallways, laundry rooms and second baths. You can now add natural light to places that were difficult to reach or too far away from your home’s roof. By installing a skylight onto your home, Live Oak Construction can even help to reduce your energy costs while increasing your home’s curb appeal. The increase in natural light that a skylight will provide will lower your energy costs by decreasing the amount of time that your homes electric lights need to be on. Increasing natural light with a skylight may even improve your health! Studies have shown that increasing the amount of natural light that your body is exposed to can improve the production of important vitamins such as vitamin D.
Save on energy costs and make your home more beautiful by calling Live Oak Construction to install a Houston skylight in your home today. Call Live Oak Construction today at 713-991-2667 to schedule a FREE in-home consultation and estimate for Houston skylight installation.